Home / Business and Marketing / Too many LED TV brands in the market – Which one to buy? 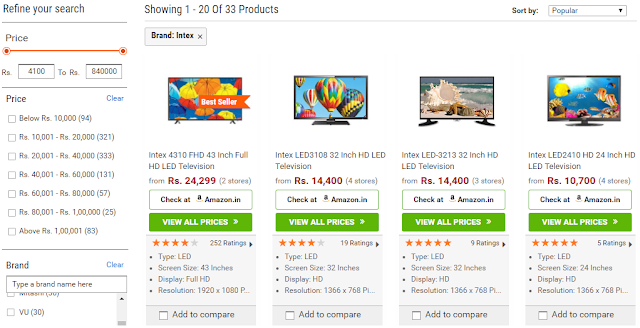 Too many LED TV brands in the market – Which one to buy? When it comes to electronics, we are spoilt for choices. If you are looking to buy a smartphone or a LED TV or any other consumer electronics, there are thousands of options to choose from- brands, price range, features, specifications, and so on. For ordinary people like us and even for those who consider themselves geeks, it is impossible to keep in memory all the features and functions of hundreds of models and decide which one is best for you. That is where comparison websites come handy. Let us take an example of LED TV. There are numerous brands, screen sizes and other features to consider before zeroing in on any specific brand and model. Brand selection is usually psychological- because your friend has Sony and has commented that it is a great brand; you might have mentally decided to go for it without even giving other brands a fair chance. If a relative has said that XYZ brand is not good- a TV he bought from that brand developed problems within months, then you are very likely to avoid that brand altogether, though the probability of you facing the same issue could be near zero. Brand selection is also influenced by marketing campaigns run by the brand and various other sales tactics. Assume you have decided to go with the brand Intex. It has been around for decades offering computer accessories such as speakers, monitors, etc. and in recent years they have expanded to mobile phones (Read my review of Intex Aqua Ace here) and LED TVs. Using comparison websites, you can see how many options exist for Intex LED TVs- almost close to 1000 models, which itself is huge. Then you can probably select a price range you are comfortable with, which will outright eliminate options beyond your budget. Say you have opted for 20000 to 40000 range, which is where most Indian middle-class families will be spending. (If you are not happy with pre-set price range you can enter your numbers- like from 12345 to 18757- most comparison websites allows that) That leaves you with 300+ options. So how do you narrow down from 330 + options to a few that you can seriously review? Next easy filter could be the rating. Maybe you can exclude models having low user rating- say one or two stars. You can also filter by screen size, 3D, curved or standard and so on. Up to 4 products can be compared in one go- a site like CompareRaja also highlights similar specifications. For a LED TV, CompareRaja shows up to 30 different features and lets you compare across your shortlisted options. It also allows you to compare prices across major e-commerce players so that you can be assured of best price as well. A price alert function can be used if you want to wait for a price drop. An easy way to simplify a complex selection process- do you agree? Check out the CompareRaja site for your next purchase.